The SysML® v2 RFP was issued on December 8, 2017. This culminated an 18-month effort to develop the requirements for the next-generation systems modeling language, which is intended to improve the precision, expressiveness, and usability over SysML v1. The requirements reflect lessons-learned from applying model-based systems engineering (MBSE) with SysML since its adoption more than 10 years ago. The RFP requires the specification to include both a SysML profile of UML® and a SysML metamodel, and a mapping between them. In addition, submitters have the option to specify additional features that include model interchange and formal semantics. The capabilities provided by SysML v2 should enable improved effectiveness and broader adoption of MBSE. Do I need to be a member of OMG to submit a letter of intent? No, you do not need to be a member of OMG to submit a letter of intent, but in order to ensure that your voice is heard and to submit to the RFP you must be a member of OMG by the submission deadline. What do I get by submitting a Letter of Intent? By submitting a letter of intent you ensure that you can submit to the RFP, either as part of a team or on your own. You are also placed on the SysML 2.0 voting list, but must be a member of OMG by the initial submission deadline in order to exercise that vote. If I don’t get my Letter of Intent in on time but I join OMG, can I still submit to the RFP? No. In order to submit to the RFP, you must submit a letter of intent by the submission deadline. How can I ensure that I get a vote on SysML v2? There are three criteria in order to vote on SysML v2: (1) you must be an OMG member in good standing by the voting list deadline; (2) you must be in a qualifying membership category that can vote at task force level; and (3) you must sign up for the voting list by sending an email to vote@omg.org. If you submit a letter of intent, you are automatically added to the voting list, but must meet the membership criteria in 1 and 2 above in order to exercise the voting option. Can I join OMG just to get a vote on SysML v2? Yes. Some companies do not have the resources to devote to all the standards that OMG maintains, but if your company has a particular interest in one standard over another, you can join and renew as your strategies and resources change. Will this automatically update ISO 19514? No. OMG Systems Modeling Language 1.4 was ratified by ISO as ISO 19514:2017. 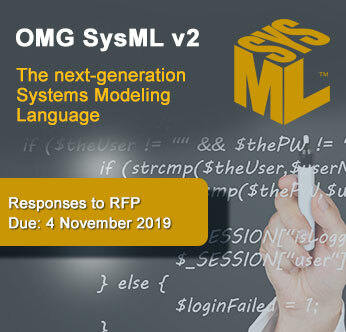 When SysML is updated to 2.0, the OMG liaison subcommittee may submit it through the ISO Fast-Track process and it will undergo the same ratification as other OMG specifications that have become ISO standards. Are these deadlines likely to change? The only authorized body allowed to change the deadlines is the OMG Analysis & Design Task Force, comprised of member companies. This Task Force meets in-person quarterly and determines the roadmap and timelines as it sees fit.